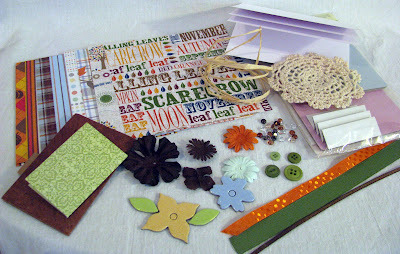 Scrappin' with DeeDee: SPOOKY Pointed Tag - BBTB Challenge & Blog Hop! SPOOKY Pointed Tag - BBTB Challenge & Blog Hop! Look what you could WIN just by leaving me a comment! Happy Monday to All My Bloggy Friends! So, it's Monday again and its time for a new challenge from Bitten By The Bug. This week Regina asked us to use the pointed tag from the Cricut Stretch Your Imagination cartridge. She also asked us to use a Halloween or Fall theme as well. I decided to make a Halloween banner. I cut out all my pieces then I started stamping my orange paper with a cheese cloth stamp and brown ink, just to give it a little extra sumthin' to look at. Then I made some paper flowers, added some buttons, ribbon, ric-rac, dew drops, flowers and dots. 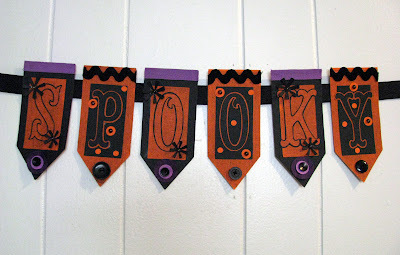 After I finished all the pieces, I glued them to a long piece of ribbon....tah-dah, a Spooky Halloween Banner! LOL! Jake will be using this banner to decorate his apartment door for a Halloween contest they are having at the end of this week.....I hope it helps him out! 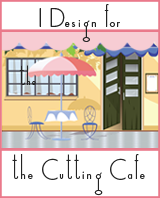 I hope you can go over and visit the Bitten By The Bug site and just look at all the wonderful creations the other designers made this week....WOW, they are awesome! 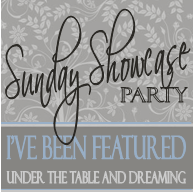 Now if you are playing along with the blog hop, you should have arrived from the UBER talented Ms. Carole and now to keep playing along.....please hop on over to the wonderfully talented Shelly's blog for more chances to WIN! ♥For a chance to WIN my blog candy up at the top of this post, just leave me a comment by Friday night at midnight my time. I will draw a name using random.org and post the winner on Saturday. THANKS for popping in to see me today, please join me next time for more card fun! HUGS! Yea!I get to be first. I always know when I go to your blog I'm going to get a treat. Your SPOOKY banner is no exception. You're so talented and inventive with your designs. Hope it helps Jack win! I love the banner. The cheese cloth was such a good idea! 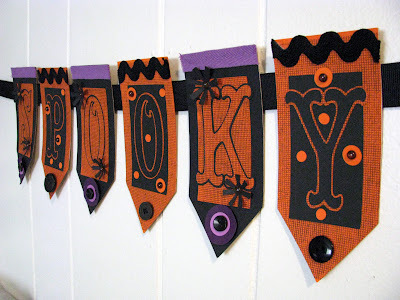 Cute SPOOKY banner. I'm sure that will come in handy this week. Thanks for the chance to win! Love how you turned the tag downward! You put so much detail into the tags - hope your son wins! Hey, DeeDee! I love the spooky banner! The cheesecloth stamp is a really cool idea/effect. Great job, as always! Thanks for the chance to win such awesome candy! Love this banner. It is so cute. Such talent! This banner is so adorable, DeeDee!! Love how the tag points downward and LOVE the cheesecloth stamp! FABULOUS! Awesome job on the challenge my friend, and good luck, Jake!!! :) hugs! Love the way you stamped the texture on your papers here - they really do look like fabric. I love this banner!!! how cool! Thank you for the inspiration! I love this banner too! GREAT IDEA! It lends itselft to other holidays as well-I can see and red, green and gold one saying JOLLY. TFS! Wow! Very well done! Better then anything you could find in a store! This banner is awesome, really looks like fabric!!! All details on each individual tag are wonderful. I hope Jake wins his contest. Love the Spooky banner! I have still have time to make one for my Mom! Thanks for the great idea and the chance to win the goodies! wow, what a great blog, looking at you slide show is hypnotizing,soooo many beautiful things to see! I am a new follower but so glad I found you. Love the tag idea. We are having a Halloween party at work this week and I may steal it. Thanks for great ideas! I just love your banner! In the picture it really looks like fabric. Thanks for the chance to win. Love the banner! The cheesecloth stamp adds a lot - I like it! How could your son not win with this awesome banner!!! what a fab idea for a banner...great job! Cute banner!! You did an awesome job! Having worked at an apartment community for 18 months I'm sure your banner will help him win! Your banner is very cute. Thanks for sharing your project. I love your banner...along with all your work. What an great banner..winner for sure with this on the door...The cheese cloth was a great idea..
Nice treat and cute banner. 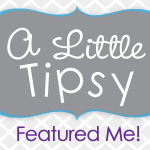 I love the cheesecloth stamped background! Very cute banner! This idea would be great for any holiday. Great job. I have just found your site after first finding the blog train. Wow wow wow. You all are sooo talented. I feel so inferior. But just visiting your site is bound to make me better. Thanks soooo much. Love the banner, I'm sure Jake will be a winner! LOVE your banner! What a truely creative way to use that cut! So much detail, it's wonderful. That banner ROCKS! I just love all the details and colors. I would have never though of using cheese cloth. Thanks for a chance at this sweet candy. Cute Banner! Love your blog! I just love your banner. Your son should definitely win! This is Spooky Fun! Love it. Great use for the tag! What a fantastic banner. It would be the talking point at any Halloween party! 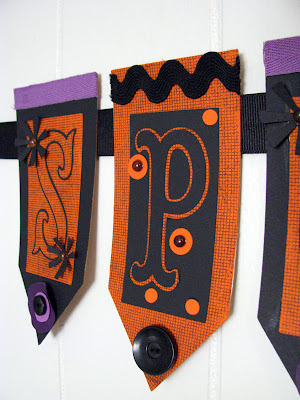 Great banner, the cheesecloth backgroundm stamp is one of my favorites. Thanks for the chance to win some blog candy! Wow DeeDee ... what fun is this!! And that cheese cloth stamp ... just too cool. What a clever idea, I never would have thought to use the tag for a banner. It's adorable! Love your banner! 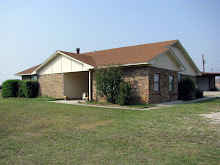 Great Blog, will be stopping by often! So incredibly creative to flip the tag to use on a banner! Awesome! I just love it! That is an awesome banner. Great work, as always. This is super cute! I'm gonna have to remember this for next year...too much to do before Saturday!! Even the most simple cuts look amazing after you get to them, great job! DeeDee, I love your banner! What great elements and texture! Your SPOOKY banner is so cute. I have never tried making a banner before. Cool way to use those tags! Love the banner! Thanks for sharing your ideas every week. Your banner is awesome!! I love blog hopping. Love the colors in your Spooky banner... it's so perfectly Halloween!